"We lost Star last night. She had been colicing since Monday evening. The vet had been out on Monday evening and Tuesday morning. I stayed by her side most of the time. She was not in a great deal of pain, but not eating or feeing well. Late last night she was no better and I asked Ron to have the vet come out once more to give her some more fluids and more oil. I wanted to know that we had done everything possible. When the vet arrived, Star's temperature was high and her heart rate very high. "This indicated that there was now some bad bowel and she was in quite a lot of pain. The options were another surgery or saying goodbye. We could just not put her through another surgery at age 31. Her recovery two years ago was very rocky and the prognosis from the vet was not good. She had just been diagnosed with Cushing's disease and it was the worst that the vet had ever seen. The vet almost guaranteed that the surgery would result in a founder and/or infection. Although the choice seemed clear, it was still extremely hard to do. She crossed over with the same gentle, brave spirit that was always her. "As I sat caressing her muzzle and the vet walked away, I looked up and saw a shooting star. I told Ron that there she was, blazing through the sky joyous and free." Imagine a horse who could somehow decipher and carry out the commands of a severely impaired child, a gentle animal politely picking up each hoof before a child even reaches down to clean it...the kind of horse who nickers at each person who enters the barn, graciously accepts endless kisses on her nose. And she did it day after day, year after year, with never a trace of ill humor. 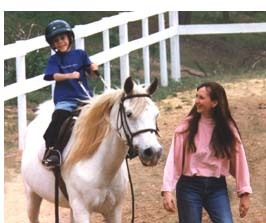 Star was raised and trained from birth by Lorelei Ling, and together the two of them lived all over the country. 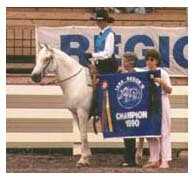 Shown with great success as a hunter and English and Western Pleasure, Star was named a Top Ten Trail Horse at the Arabian National Championships in Alburquerque in 1977. When Lorelei and Star moved to a 17,000 acre cattle ranch in the 1980's, Star became a very hard working ranch horse and gained the respect of the local cowboys and ranchers as an exceptional cow horse. At the age of 20, she made a "comeback" and won the Region VI Arab Trail Horse Championship. As she grew older but none the less graceful, Star moved into semi-retirement and devoted most of her services to being a therapeutic riding horse, although she occasionally ventured back into the show ring with a young rider. She also enjoyed putting a loose calf back in the pasture when the chance arose. Like the other horses at Gallastar, Star was quiet, kind, and obedient. Her advanced training allowed students to maneuver her through and over obstacles, to jump, and even cut off a cow now and then. But what Star possessed went far beyond that. The magic that Star worked was demonstrated in the ways Gallastar's clients reacted to her. The withdrawn youngsters whose eyes lit up with delight as they got Star to do one of her tricks...the unattached, rageful young man who cried unashamedly when he had to tell Star goodbye...the cancer patient who in the last weeks of her life fulfilled a lifelong dream of riding a horse, but even more important found a sympathetic, gentle friend who allowed this woman to sit and stroke her bowed head for 30 minutes...all of these are images of Star that forever linger for those who knew her. She was the loving matriarch and namesake of Gallastar's programs. To many of our kids, Star became the all loving, all accepting, totally dependable grandma they may have never known before. Copyright © 1999-2002 by Gallastar Equine Center. All rights reserved. No material on these pages may be duplicated without permission. For information contact pulliaml@juno.com. Web Design by StationR.